I recently had the opportunity to sit down over dinner with Bill Price, an investor in several wine ventures over the past twenty years including Chateau St. Jean, Kistler Vineyards and Kosta Browne. In 2002, he founded Three Sticks, a winery devoted to creating wines from the renowned 200-acre Durell Vineyard and small lots of wines from other exceptional vineyard sites. Ed Durell first planted his vineyard in 1979 on a cattle ranch in the foothills of Sonoma Valley due west of the town of Sonoma, surrounded by the foothills of the Mayacamas Mountains. He enlisted a family friend, Steve Hill, to plant and tend the grapes on the ranch and Durell began selling grapes to Sonoma County wineries in 1982. Bill and Ellie Price (Bill's former spouse) bought Durell Vineyard in 1997. The couple had a very amicable divorce, with each assuming control of a portion of the Durell Vineyard, while still working together. Bill's portion is currently under the holding title of Price Family Vineyards and Ellie's part is held by Sand Hill Wines LLC. Ellie Phipps Price previously produced Durell Vineyard Pinot Noir and Chardonnay under the Sand Hill at Durell Vineyard label, replaced in the 2008 vintage with Pinot Noir and Chardonnay from the 8.5-acre Ranch House Block of the vineyard under the Dunstan label. Ellie Phipps Price total holdings include 60 acres of the Carneros portion of the vineyard (36 acres of Pinot Noir and 15 acres of Chardonnay). Bill Price owns 130 acres of Durell Vineyard in the Carneros, Sonoma Valley and Sonoma Coast portions of the vineyard, planted to Chardonnay (75 acres), Pinot Noir (23 acres), a tiny amount of Syrah, and Cabernet Sauvignon. Due to its unique location, the 400 acres of land on which Durell Vineyard is situated has vines in three different appellations: Carneros, Sonoma Coast and Sonoma Valley. The rocky soils and cool climate are ideal for Chardonnay and Pinot Noir, with the 2,400 foot Mayacamas Mountains range sheltering the vineyard from the daily maritime winds originating from the San Francisco Bay, just ten miles to the south. The 59 acres of Pinot Noir in the Durell Vineyard includes Dijon clones 114, 115, 667, 777, 828 as well as some Swan and Calera selections. Steve Hill managed the entire vineyard until the beginning of 2011 when Rob Harris took over as vineyard manager. Steve Hill continues to work with Bill on other vineyard acquisitions. The Durell Vineyard has been the source of Chardonnay, Pinot Noir and Syrah for many noted wineries and currently sells grapes to 27 wineries, among them Auteur, Chasseur, Chateau St. Jean, Dunstan, Kistler Vineyards, Lioco, Loring Wine Co., Pali Wine Co., Sand Hill, Saxon Brown, Steele and Three Sticks. Frequently, Durell Vineyard is designated on the label. Kistler Durell Vineyard Chardonnay has been a benchmark California Chardonnay for many years. The winemaker for Three Sticks Wines is Dan Van Staaveren, the former winemaker of Chateau St. Jean (1985 to 1997), Sand Hill and Dunstan. Kenneth Juhasz became the winemaker for Dunstan after the 2010 vintage. In September 2011, I attended a Three Sticks Durell Vineyard wine dinner at Gordon Ramsay at The London West Hollywood. This was an opportunity to sample three vintages of Durell Vineyard Sonoma Coast Pinot Noir, the recently released 2009 Durell Vineyard Sonoma Coast Chardonnay, the 2008 “The James” Sta. Rita Hills Pinot Noir, and three vintages of Sonoma Valley Cabernet Sauvignon. I do not have extensive tasting notes on the wines served at dinner but can make the following general comments. The 2009 Three Sticks Durell Vineyard Chardonnay is a mix of Wente and Dijon clones aged in 50% new French oak barrels and 20% in cement egg fermenters. A classic Chardonnay with aromas and flavors of butterscotch, creme brulee, honey, pear and citrus, along with well-integrated oak and crisp acidity. Balance is spot on for this sophisticated offering. 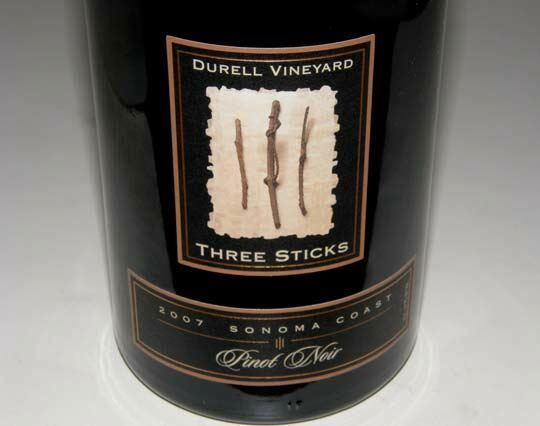 The 2004 Three Sticks Durell Vineyard Pinot Noir was vinified by winemaker Jeff Gaffner. The wine has held up nicely, crafted in a full-bodied, extracted style with very ripe flavors including raisin. The 2006 Three Sticks Durell Vineyard Pinot Noir and the 2008 Three Sticks Durell Vineyard Pinot Noir are moderately rich and more elegant in style with judicious use of oak and show the soft texture that is Pinot’s calling card. The 2007 vintage has been previously reviewed in this newsletter. The 2008 Three Sticks “The James” Sta. Rita Hills Pinot Noir is sourced from Burning Creek Vineyard. Only 120 cases produced. Very aromatic with bright cherry and berry flavors framed by lively acidity. Promiscuous and hard to take your hands off this one. The 2005, 2006 and 2007 Three Sticks Sonoma Valley Cabernet Sauvignons are beautifully crafted wines showing the deft touch Dan Van Staaveren has with this varietal. The 2007 vintage, recently released, is a dreamy wine that only hints now at its potential. Three Sticks Wines is one of the few wineries in California to succeed with the trifecta: Pinot Noir, Cabernet Sauvignon and Chardonnay. The superb quality of the portfolio of Three Sticks wines is easily understandable: relatively old vine vineyard farmed by a highly respected long time vineyard manager, a talented, veteran winemaker, and management with years of experience in the wine business. Three Sticks wines are sold through an allocation list due to the small production. Visit the website at www.threestickswines.com to sign up for the mailing list.